NASA has released a new, improved portrait of mankind’s deepest-ever view of the universe. The Hubble Ultra Deep Field image shows an area of space photographed over time, faint light collected over many hours of observation, containing thousands of galaxies, both nearby and very distant, making it the deepest image of the universe ever taken. Hubble pointed at a tiny patch of southern sky in repeat visits (made over the past decade) for a total of 50 days, with a total exposure time of 2 million seconds. More than 2,000 images of the same narrow field were taken with Hubble’s two premier cameras to reveal the faintest and most distant galaxies ever seen. 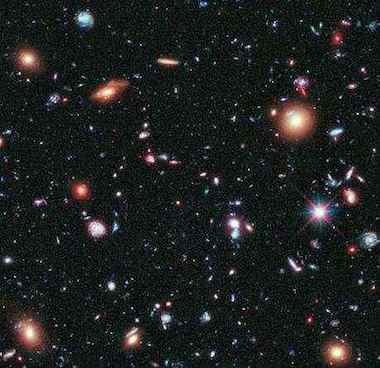 The Deep Field Photo (shown above, cropped) reveals about 5,500 galaxies.